Brief research shows that Elizabeth Wilson’s maiden name was Mathews. Where or when she was married is unknown. She was the daughter of John Mathews (1700-1783) and Grace Sewell (1704- 1788). Their marriage was registered in Skelton parish 15 July 1731. Grace was baptised 13 April 1732 and her brother Joseph on 21 May 1735. Elizabeth Wilson received money to help with the care of her mother on 1st November 1785. Other vouchers signed by Isaac Dodd, Vestry Clerk, are of a similar freehand format. The payment to Elizabeth was delivered by the hand of Isaac Holm. It is assumed that the money was collected from or sent to a predetermined place known to Skelton people. Very often this would have been an inn or a well-known shop. Letters from Elizabeth Wilson to Isaac Dodd were addressed with instructions to be left at the Black Bull, Penrith. The Black Bull was situated in the Corn Market area of Penrith. It had eight lodging rooms and stabling for 21 horses. In 1790 a Mr Murthwaite was the victualler there. Rye was sold outside the Black Bull, wheat at the Black Lion, oats at the Fish Inn and White Hart Inn, and barley at the Griffin. All were situated in or near the Cornmarket area. Counterfeit coins were problematic around this time and up until the 1830s. Punishment could be severe. Weighing a coin was a way of trying to determine its authenticity. It may have been that Elizabeth thought she had been given money that had been clipped, or that it was a newer design of coin recently minted that she did not recognise. The hand writing in the two letters differs so Elizabeth may have sought help to write them. 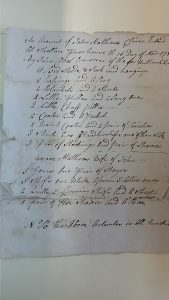 Further vouchers from the parish of Skelton have been found since this original blog was written that show Elizabeth Wilson’s parents John and Grace received help from the Parish prior to Grace being cared for by Elizabeth. In February 1781 an account of their belongings at Skelton poorhouse was made. The overseer for the poor being a John Pool of Unthank quarter. 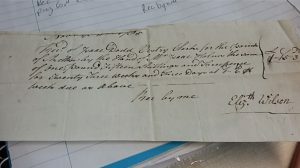 [photo below] After John’s death on 26 February 1783 Ann Steele received a payment of £1.6s.6d. for the maintenance of Grace. The payment was made by Isaac Dodd.